a vote cast (usually via mail) by someone who is unable to visit the official polling station on election day. 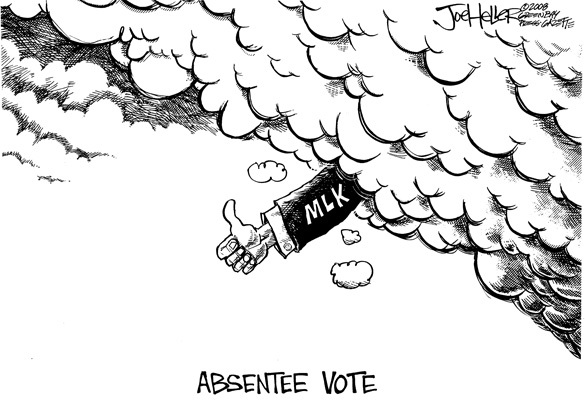 The allowance of absentee ballots is regarded by some as an effective way to improve voter turnout. Some jurisdictions require that a valid reason be proven, such as sickness or travel, before a voter is granted an absentee ballot. …a form of advocacy in support of a political, organizational, or corporate agenda, designed to give the appearance of a “grassroots” movement. The goal of such campaigns is to disguise the efforts of a political or commercial entity as an independent public reaction to another political entity—a politician, political group, product, service or event. The term is a derivation of AstroTurf, a brand of synthetic carpeting designed to look like natural grass.